As the best movers in Chicago, we offer you the option of doing your own packing or allowing us to do some, or all, of the work for you. Packing is time consuming and can be stressful, but our experienced moving specialists move quickly and efficiently with the right equipment and supplies to get the job done to perfection. If you are packing yourself, call us first to see if we might be able to help you with the proper supplies. 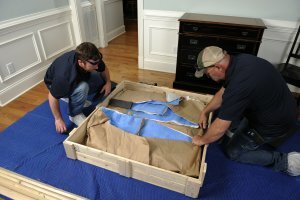 We can also offer some guidance on how heavily boxes should be packed and what to do with your antiques or valuable heirlooms, as well as unique items with unusual shapes, like lamps and shades. Proud to be your best movers in Chicago, we are happy to offer suggestions! Perhaps you are considering being fully packed by Advantage Moving & Storage. Great! We are fast and professional movers who love to save you time. We will carefully pack everything in an orderly manner, sealing and labeling all boxes, so it is easily found and accessible after you arrive in your new location. We keep supplies on hand for packing and protecting even the most awkward items that might be impossible for you to pack by yourself. Most people who choose to have us do full-house packing are pleased at the amount of time they have saved themselves. Additionally, your household goods are fully insured against damage if we do the packing. It is easily worth the money when you can eliminate stress and use your personal time on other important things! Wouldn’t the best movers in Chicago help you with your clothing and coats from the closets? We think so! Advantage Moving & Storage will collect your hanging clothes from your closets, transport them in our hanging wardrobe boxes, and hang them up for you again in your new home in the same good condition. Maybe you prefer to do most of your own packing but only want us to pack the most fragile items, the most expensive, or the most sentimental family treasures. At a minimum, you will probably prefer that your most valuable pieces be insured in the move. A partial packing is an available option for you, as well! Whether we can do a full- or semi-service pack for you, or you need to talk to an expert to decide, contact the best movers in Chicago, Advantage Moving and Storage, to learn more.